In the field of medical imaging, technological improvements in imaging have begat ever closer clinical collaborations. When a CT scanner can provide cranial imagery in eight minutes instead of 30, for example, it becomes a modality suitable for use in trauma and ER units. This relationship between device sophistication and clinical practice in turn makes health systems reconsider how they allocate their capital resources and array their inventories. After a couple decades, the depth and degree of that change starts to show broader implications for the planning, design and construction of health care facilities. The faster the technological advances, the quicker institutions must move to keep pace and, at some point, those mechanical gains outstripped design and construction standards. 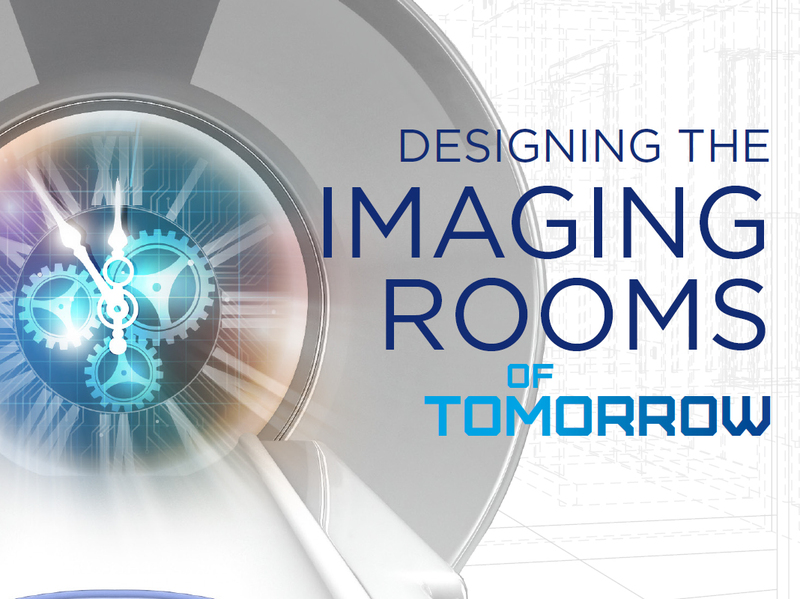 To prepare for the increasing expansion of medical imaging services into a variety of health care settings in the years to come requires bringing design standards up to code. Gilk is a volunteer with the Facilities Guideline Institute’s (FGI) Healthcare Guideline Revision Committee, which develops minimum design requirements for planning, designing and constructing health care facilities. These are revised on a continuous process and republished every four years to incorporate the best practices in the field as well as to eliminate conflicts between the latest version of the standard and clinical practice. In short, Gilk said, medical imaging was moving too quickly for that process to keep up. Gilk pointed out how FGI design criteria for CT suites, for example, were presented as being universal in earlier iterations of the document; today, the variety of needs among providers in different clinical settings no longer makes this so. In response, the FGI has taken the tack that any device itself would no longer be “the first stop in defining the destination of what that space should be,” Gilk said. Instead, the new first stop is a classification system built around how that device will be used to diagnose and treat a patient. “Once you’ve decided the highest level of care in this acuity or intervention classification system, then you say, what are the design criteria for the technology, and how do those design criteria change if we’re talking about a Class I, strictly diagnostic image, versus a Class II, where you are doing heavy sedation and general anesthesia, or image-guided biopsies and other types of interventional procedures?” Gilk said. “Now we have a different set of support characteristics for that space. It may be emergency power, different HVAC, how cleanable the surfaces and materials are inside that suite. Class III, with the rise of hybrid OR, are inter-operative imaging suites, and the demands for patient care and patient support grow even more significant in that regard. Part of the inspiration for that shift in thinking is that radiology departments don’t exist in the same way they once did, Gilk said: medical imaging is no longer a centralized destination, but has become a clinical service deployed throughout the entirety of a health system and its facilities. The FGI classification system is a response to “the disaggregation of imaging as a service line” amid “greater levels of patient intervention and patient acuity,” both of which are factors that influence facilities planning. So too does the portability of health care and the rise of in-home care along the greater trend line of a diverse patient cohort. As these and other hard-to-project, key variables offer increasing complexity in planning for the future of imaging rooms, Gilk advocates that his clients adopt a “rowboat and canoe” perspective when budgeting. Building for additional capacity and throughput of a variety of patients with discrete health care needs may also be one of the best ways for many institutions to vouchsafe their financial survival. Often, a facilities expansion can allow for greater efficiencies as well as greater volumes, and although the capital outlay to do so may be significant, the potential for increased revenue yields an opportunity to outpace the rate of declining revenues. Just as important in designing imaging suites that are built to last for the next decade is looking at ways to take stock of existing spaces, said Eddie Acosta, director of business development for the Colin Construction Company of Auburn, California. Changing out existing infrastructure to accommodate next-generation imaging equipment can require re-evaluating the composition and nature of shielding in the walls of rad and fluoro rooms, considering the operations in the rooms above or below the imaging suites, and just generally having more interdepartmental conversations about the changing needs of the professionals who will rely on the equipment involved. John Metellus, MR product manager at Siemens Healthineers North America of Malvern, Pennsylvania, said that the shrinking footprint of imaging equipment like MR units reflects advancements in its mechanical composition as well as in its total cost of ownership. Reconfiguring magnet cryo-cooling systems to run nitrogen-free and then with less helium helped with weight and servicing of MR equipment while reducing the amount of space needed to store those cryogens. Zero-boil-off magnets can limit helium consumption, collecting its condensate to help extend the time needed between refills, as well as helping limit the fossil fuel usage associated with its production, he said. All these factors combine to make the technology more adaptable to a variety of environments. Metellus’ colleague, Matthew Dedman, CT marketing director for Siemens Healthineers North America, said that as MR pushes more into operating-room environments, CT is pushing into hybrid interventional radiology suites. Facilitating that physical installation is a rail system that enables the scanner to be brought to the patient table to incorporate radiography data, and then shifted back out, as many times as it’s needed per procedure. Other ways of saving space in the imaging room include transferring controls to a mobile unit; the Siemens Somatom go CT scanner platform is operated by a technologist via a mobile tablet, and the computers associated with a typical CT are integrated directly into the gantry itself. “It’s not something welcome from the proceduralists, but it makes a lot of sense to introduce versatility,” Dewey said. “The key is to develop the platform in a way to address all of those without compromising any of them. It’s difficult to get away from the fact that you need a complex piece of technology to guide these procedures; the counter to that is to really just ensure that it’s something that is utilized fully. As manufacturers press on with multidimensional technology platforms, Jesse Peterson, director of shared services at GE Health Services of Chicago, Illinois, said that facilities’ managers should still be designing universal rooms that can offer the flexibility of each of the various imaging specialties provided within. Such considerations affect building in capacity for power, heating, ventilation, and air conditioning, patient access and workflow. Thinking toward the future builds additional flexibility into a space, he said. Peterson also foresees the imaging rooms of the future will focus on elements of patient comfort, from the aesthetics of lighting and paint colors to piped-in sound, visuals through digital imaging, “even the way airflow is handled.” The more comfortable patients are, the less anxiety they have around the imaging study, and the faster and easier it’ll go, he said. Putting more of the experience into the hands of the patient is another way to do it.